Ecomax tyres capitalise on tyre advances and improvements that provide much better fuel efficiency for ultra-high performance vehicles and journeys. To meet ever tightening regulations, Infinity have presented Ecomax tyres as a leading product that offers excellent performance as well as efficiency. You will benefit from grip and traction on every journey, more responsive steering and stability through corners as well as safety features like increased water dispersion. There are no better value tyres than Infinity’s Ecomax for all your needs. Ecomax tyres capitalise on tyre advances and improvements that provide much better fuel efficiency for ultra-high performance vehicles and journeys. 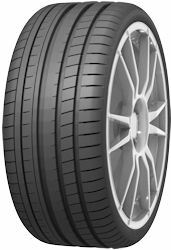 To meet ever tightening regulations, Infinity have presented Ecomax tyres as a leading product that offers excellent performance as well as efficiency.You will benefit from grip and traction on every journey, more responsive steering and stability through corners as well as safety features like increased water dispersion. There are no better value tyres than Infinity’s Ecomax for all your needs.